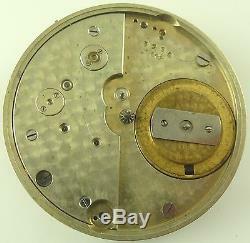 Jacot partial high-grade Swiss pocket watch movement - parts / repair. This movement measures 45.05mm diameter x 12.35mm center thickness. 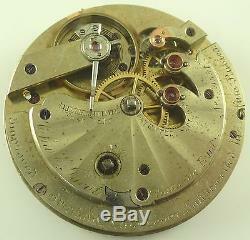 It is missing the dial, hands, hour-wheel and 1 other wheel under the dial - see photos. The 4th wheel pinion is broken. The balance is good and the movement does tick. Jacot Chaux de Fonds No 9551 Improved Straight Line Lever Full Jewelled in Fine Rubis PATENTED SEPT 1859. This movement is not entirely complete. Please view the photos carefully to be sure of what is included. This movement has not been checked for duration or accuracy, even if it is described as "running". Jacot Partial Pocket Watch Movement High-Grade Swiss" is in sale since Wednesday, May 31, 2017. This item is in the category "Jewelry & Watches\Watches, Parts & Accessories\Parts, Tools & Guides\Parts\Movements". The seller is "kstar1977" and is located in Hollis Center, Maine. This item can be shipped worldwide.